Seroma formation following modified radical mastectomy with axillary lymph node dissection for breast cancer is a most common wound complication. In our experience seroma occurs in approximately 50% of patients undergoing mastectomy. Postmastectomy seromas usually vanishes within a few weeks after operation. In this report we present the case of a 73 year old woman who had undergone mastectomy with axillary lymph node dissection for breast cancer, complicated by lymphorrhea and formation fibrous encapsulated seroma resistant to conservative treatment which required surgical resection. We stand in opinion that in some cases of prolonged seromatous effusion with confirmed formation of thick walled reservoir the operation with resection and closure of supplying regional lymph vessels may be the best treatment, if possible preceded by arm lymphoscyntygraphy. A seroma is a serous fluid collection which may develop in the space between the chest wall and skin flaps following mastectomy with axillary lymph node dissection for breast cancer. Seroma formation following mastectomy is a most common wound complication . The incidence of seroma has been shown to correlate with patient's age, breast size and hypertension, presence of malignant nodes in the axilla, previous surgical biopsy and use of heparin [2–7]. Seroma formation may be also operator dependent and related to surgical techniques [8–10]. In our experience seroma occurs in approximately 50% of patients undergoing modified radical mastectomy for breast cancer. Although it usually vanishes within a few weeks, some patients may require repeated aspirations even for a period of months. In this report we present the rare case of the fibrous encapsulated seroma resistant to conservative treatment which required surgical resection. The spindle-like serous pouch located in the subcutaneus tissue on the greater pectoral muscle, arrow indicate vessel like structure penetrating deep in to posterior site of axilla. The seroma wall stained with hematoxylin/eosin under 100× magnification. 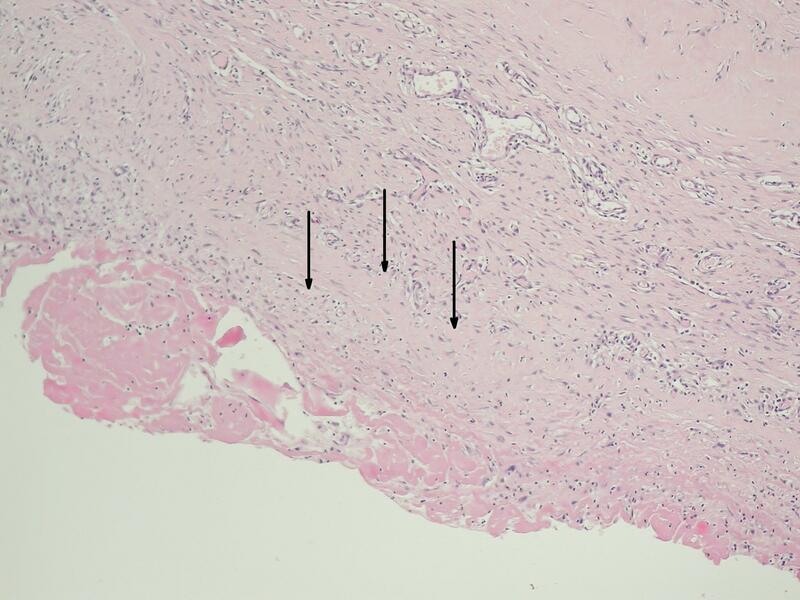 Arrows indicate seroma capsule composed of fibrous tissue with eosinophilic hyaline degeneration of collagen and weak inflammatory, predominantly lymphocytic, infiltration. No epithelium was present on the inner surface of the seroma capsule. A seroma is a serous fluid collection which develops in the space between the chest wall and skin flaps following mastectomy and axillary dissection. The Incidence of seroma formation following mastectomy may exceed 50% . Although it usually vanishes within a few weeks, some patients may require repeated aspirations even for a period of months. Prolonged accumulation of postmastectomy seroma and repeated aspirations predisposes to sepsis, wound-related complications and may delay adjuvant therapy. There are many factors, which may increase or decrease seroma formation [2, 3]. The incidence of seroma has been shown to correlate with patient's age, breast size and hypertension, presence of malignant nodes in the axilla, previous surgical biopsy and use of heparin [4–7]. Seroma formation may be also operator dependent and related to surgical techniques. Closure of dead space by suturing the wound flaps reduces the incidence of seroma formation, while the use of tissue glue to close the dead space remains controversial [8–10]. Mechanical pressure does not reduce the drainage of seroma . Some evidence exists that tissue injury due to diathermy may be the cause of increased seroma formation . The kind of drainage or no drainage and the timing of drain removal remain controversial. Closed suction drainage systems are preferable to open systems . There is no advantage on amount or duration of drainage in use of single or multiple drains . Comparison between low versus high vacuum drainage revealed no significant difference in the volume of fluid, duration of drainage or complication rate in studied groups of patients . Some studies have advocated that the early removal of drains within the first week leads to increased seroma incidence, whereas others have shown that removal within five days has no influence . It has been suggested prolonged drainage may perpetuate the volume drained, as drains can cause tissue inflammation. Leaving no drainage may lead to higher seroma formation rate and may be controversial but applicable to certain group of patients. Shortening of hospital stay may be achieved by early discharge with drain in situ. It was hypothesised that daily aspirations of seromas would keep the wound cavity dry and allow the wound flaps to adhere to the chest wall preventing accumulation of fluid, resulting in a more rapid resolution. This hypothesis was not proven, patients undergoing daily aspiration of seroma required significantly more aspirations without reducing the time from drain removal to final aspiration, therefore seromas should only be aspirated when symptomatic . Delaying shoulder physiotherapy reduces drainage . The origin of seroma is unclear. Studies on the composition of the fluid collected from post mastectomy drainage suggest its inflammatory origin while others hypothesized that seroma is most likely to originate from lymph [19, 20]. In our case due to the large volume of seromatous fluid drained from the wound, both the inflammatory and lymphatic origin of effusion were taken in to consideration. 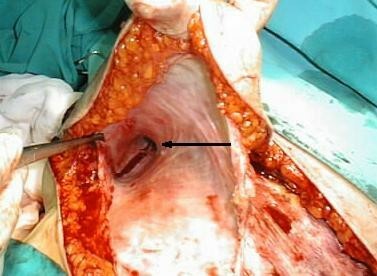 If seroma formation or the subcutaneous collection of fluid was an inflammatory exudate, then careful surgical excision with closure of dead space may be effective in reducing this complication. But in case seromatous reservoir was connected and supplied by divided lymphatics collecting lymph from arm or trunk such excision would result in the development of both lymph edema and arm swelling. In the second case it would be more appropriate to find the lymphatic vessel supplying the reservoir and to perform vascular junction with axillary vein. Even though it is technically difficult and not commonly available in every hospital, lymphangiography of the right superior limb would be the method of choice for visualization of lymphatic drainage from the arm. The result of lymphangiography may be crucial for operative proceedings. In our case the patient did not agree for such examination. We decided to examine connection to lymphatics by injection of 2 ml of Patent Blue V subcutaneously in the arm and forearm 30 minutes prior to operation, speculating that lymphatic drainage from the upper limb if present, would color fluid in the serous reservoir. Although during resection we didn't observe change in drainage color, axillary end of the reservoir narrowed and formed a vessel which branched on the lateral side of trunk. That may suggest lymphatic compound of cistern formation. Those vessels were stained by injection of Patent Blue V dye and closed separately. On postoperative histological examination the connection of reservoir to lymphatic vessel was not proven. Even though there was no sign of vascular endothelium on the seroma wall and vessel supplying the superior end of seromatous reservoir, we considered that formation of such chronic seroma may have twofold etiology, both inflammatory and lymphatic. A similar case of fibrous encapsulated seroma following radical mastectomy, resistant to conservative treatment which finally required surgical resection was previously reported by Yoichi Matsui et all . We stand in opinion that in some cases of prolonged seromatous effusion with confirmed formation of thick walled reservoir the operation with resection and closure of supplying regional lymph vessels may be the best treatment, if possible preceded by lymphoscyntygraphy. The authors acknowledge that the patients consent was obtained for publication of this case report.